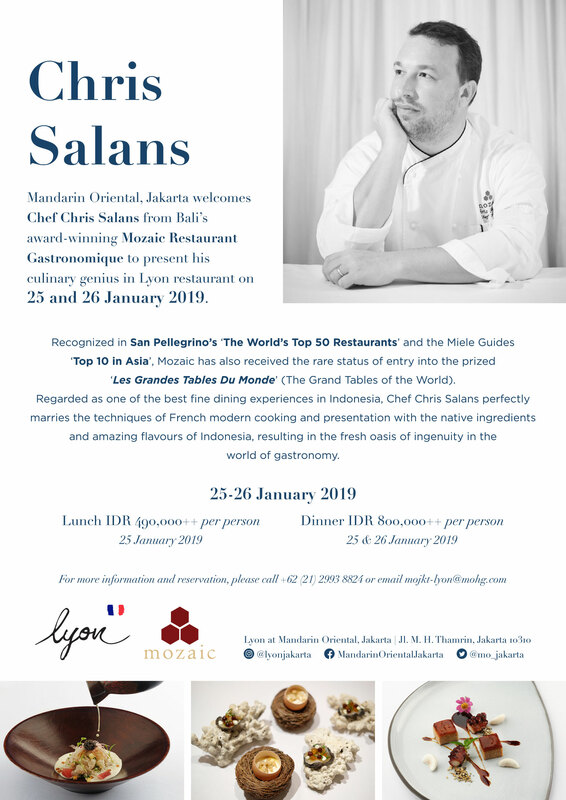 Jakarta, 8 January 2019 – Chef Chris Salans from Bali’s award-winning Mozaic Restaurant Gastronomique, will present exquisite lunch and dinner set menus on 25 and 26 January 2019 at Lyon restaurant at Mandarin Oriental, Jakarta. Recognized in San Pellegrino’s ‘The World’s Top 50 Restaurants’ and the Miele Guides ‘Top 10 in Asia’, Mozaic has also received the rare status entry into the prized ‘Les Grandes Tables Du Monde’ (The Grand Tables of the World). Regarded as one of the best fine dining experiences in Indonesia, Chef Chris Salans perfectly marries the techniques of French modern cooking and presentation with the native ingredients and amazing flavours of Indonesia, resulting in the fresh oasis of ingenuity in the world of gastronomy. The dining experience at Mozaic has become the hallmark of its reputation, encompassing the quality of the ingredients, the perfect execution, and the sheer multitude of flavours. The specially crafted set menus featuring Chef Chris Salans’ signature dishes will be available at Lyon for lunch at IDR 490,000++ per person (25 January 2019 only) and for dinner at IDR 800,000++ per person (25 and 26 January 2019). For more information or reservations, kindly contact +62 (21) 2993 8824 or email to mojkt-lyon@mohg.com. American-born and raised in France, Chef Salans began his training at Le Cordon Bleu in Paris before taking internships in France at Michelin-starred restaurants such as L’Oustau de Baumaniere and Lucas Carton. His culinary career brought him to New York where he worked as Sous Chef for David Bouley and then as Chef de Cuisine for Thomas Keller in Napa Valley. It was during this time that Chef Salans developed such awe for Asian cuisine that he moved to Bali and finally in 2001, opened Mozaic Restaurant Gastonomique in Ubud – the cultural heart of Bali. With our renowned Indonesian hospitality and service, Mandarin Oriental, Jakarta offers exemplary personalized service in luxurious surroundings. Located in the heart of the city, the hotel is an oasis of 21st-century luxury with 272 spacious guest rooms, including 24 suites and a variety of award-winning restaurants and bar concepts, which become the meeting place of choice for hotel guests and the local community. The state-of-the-art meeting and banqueting facilities also provide the best venues for both business and social events. For more information and reservations visit www.mandarinoriental.com/jakarta.